The first permanent photograph (later accidentally destroyed) was an image produced in 1822 by the French inventor Joseph Nicéphore Niépce. His photographs were produced on a polished pewter plate covered with a petroleum derivative called bitumen of Judea. View from the Window at Le Gras (La cour du domaine du Gras) was the first successful permanent photograph, created by Nicéphore Niépce in 1826 at Saint-Loup-de-Varennes. Niépce captured the photo with a camera obscurafocused onto a sheet of 20 × 25 cm oil-treated bitumen. As a result of the 8-hour exposure, sunlight illuminates the buildings on both sides. Boulevard du Temple, taken byLouis Daguerrein late 1838, was the first-ever photograph of a person. It is an image of a busy street, but because exposure time was over ten minutes, the city traffic was moving too much to appear. The exception is a man in the bottom left corner, who stood still getting his boots polished long enough to show up in the picture. A daguerreotype image believed to be of railway worker Phineas Gage holding a tamping iron that went through his head during an explosion on a worksite in 1848. Phineas P. Gage (July 9?, 1823 – May 21, 1860)was a railroad construction foreman now remembered for his incredible survival of an accident in which a large iron rod was driven completely through his head, destroying one or both of his brain’s frontal lobes, and for that injury’s reported effects on his personality and behavior—effects so profound that friends saw him as “no longer Gage.” Gage recovered from the accident and retained full possession of his reason, but his wife and other people close to him soon began to notice dramatic changes in his personality. 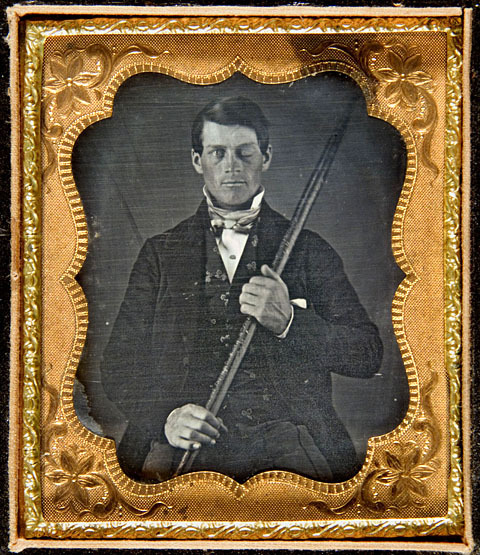 Phineas Gage’s brain was not subjected to any medical examination at that time, but seven years later his body was exhumed so his skull could be studied. Today Gage’s skull is on permanent display at Harvard’s Countway Library of Medicine. How curious the similarities between the photo of the flag being raised over the Reichstag and the flag raising on Mt. Suribachi on Iwo Jima, in that the famous picture of the Marines was also a re-enactment of an earlier raising. Soldier, according to dictionary.com, can be “one engaged in military service”. That may not be the most common usage, but close enough for me! Picture #17 show French soldiers(I think) engaged in trench warfare. Since ww1 had not started yet, the date must be wrong, or that is not a Frenchman, or there was another war. I’d like to know. Anyone? There’s this black guy that’s ALWAYS in the crowd at Rockefeller Plaza in the Today show. I switch it on and the kids i always yell “SuperFly!!! !” when we spot him. I reference him as Don Cornelius. Watching American Bandstand,then Soul Train on Saturday mornings and dancing like happy epileptics would have been a great way to start the weekend. It was always after a slumber party with a friend or cousin’s house. Aretha Franklin singing “Rock Steady” may be the first one I remember-I was about five and would hula-hoop like Alvin on speed. Does anyone remember “the Bump”? The Afro-Sheen commercials were so fly. Even though Don Cornelius’s funeral is very private,I expect you will have a memorial/tribute show for him. Singers should be those who are capable of doing with dignity.It could be best to have people who appeared on Soul Train during its peak years. Any ideas,hussies? What’s the story regarding photo #9? Could this be the Orr Brothers Photographers…twins from Indiana, who moved to Illinois and then Oklahoma. The brothers Robert and William were born in 1863 and are shown in U.S. Census’s as being photographers and owning a Photography Shop. Any info would be greatly appreciated. In regards to number 22 of the soviet forces raising the flag in Berlin you missed an important detail. There were to versions of this photograph, the first which you have displayed clearly shows two wristwatches on the soldier helping the one planting the flag. Russian brass had the photographer doctor the image to remove one of them as it was evidence of Russian soldiers looting after their victory.